One of the most exciting components of each Berkeley Festival is the Fringe — a series of self-produced concerts by individuals and ensembles from around the world. The Fringe offers a perfect opportunity for your ensemble to showcase its unique talents to a large and appreciative audience. FRINGE EVENT REGISTRATION IS NOW CLOSED! Pay SFEMS securely online or send a check to SFEMS, P.O. Box 27495, San Francisco, CA 94127. Note that BFX does not officially start until Sunday, June 3, but the preceding day is available for pre-Festival Fringe concerts. Also, we draw your attention to the possibility of scheduling a late-night concert (e.g., a 10:00 pm start time). Mainstage evening concerts are starting earlier this year, in part to make later concerts more viable. The only 10:00 concert scheduled for the Mainstage is on Thursday; the late-night time slot is available for Fringe concerts on all other days. 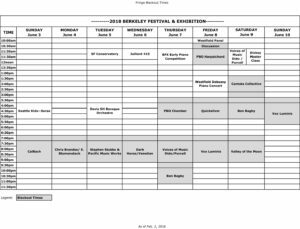 The Berkeley area offers many fine locations for Fringe performances, some within walking distance of the main BFX venues and some a short drive away. SFEMS provides a suggested venue list for Fringe performers. These venues are suggestions only and are not endorsed in any way by SFEMS. Please contact the venue directly to reserve your time and make payment arrangements. Note that some venues will require that any organizations renting their facilities must have non-profit status and/or must provide their own event insurance. If your organization is not a SFEMS affiliate, be sure to ask about such requirements when contacting the venues. SFEMS affiliates can rely upon SFEMS’ non-profit status and insurance. Special note regarding Loper Chapel: Loper Chapel at First Congregational Church of Berkeley (FCC) is a popular venue for Fringe events. However, Loper Chapel is available this year only on a very limited basis (due to the 2016 fire, FCC is short on space for their own activities), and the church will not accept direct bookings. A limited number of weeknight and weekend slots are available through SFEMS for SFEMS-sponsored and SFEMS affiliate events only. For interest in Loper Chapel, please contact SFEMS directly at bfx.fringe@sfems.org. 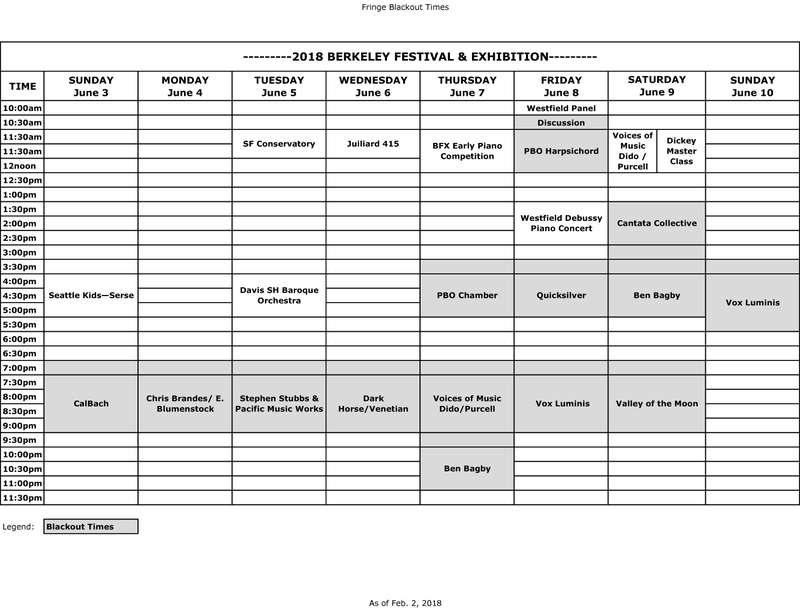 SFEMS, as producer of the 2018 Berkeley Festival, offers a range of services for individuals and groups wishing to present Fringe events. The services are optional and are available to everyone on a first-come, first-served basis. —Expanded page for your event linked from the BFX 2018 Fringe Calendar, including performers’ bios, additional photos, etc. —Online link to PDFs of full program, program notes, and any other information provided. Please note that concert and program information received after May 6th, 2018 cannot be included in the Festival Program Booklet, Fringe publicity flyer, or press releases. Go to the online Fringe Registration Form. Pay SFEMS securely on line or send a check to SFEMS, P.O. Box 27495, San Francisco, CA 94127.